11:00-11:45: How do we get there? Steps towards systemic adoption of learning analytics. Dragan Gasevic. University of Edinburgh. 11:45-12:30: The role of ethics and privacy for policy making in Learning Analytics. Prof. Dr. Hendrik Drachsler, University of Applied Sciences Zuyd y Open University of the Netherlands. 12:30-13:15: Learning analytics initiatives and policies in Estonia. Adolfo Ruiz Calleja. Universidad de Tallinn. 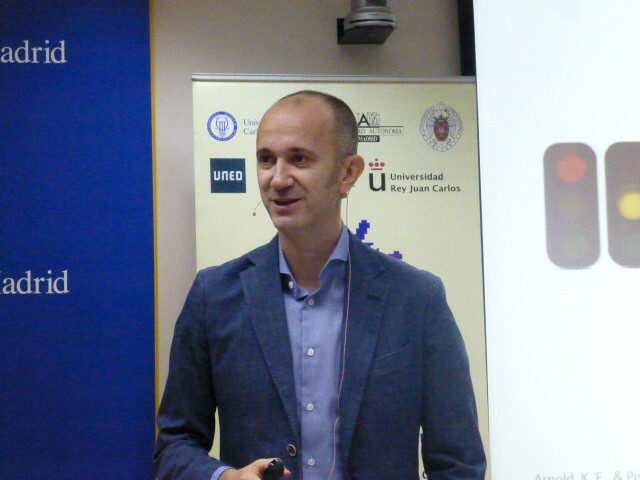 13:15-14:00: An overview of Learning Analytics activities in UC3M. Carlos Delgado Kloos y Pedro Muñoz Merino, Universidad Carlos III de Madrid. Sala Audiovisuales 3.S1.08, Biblioteca Rey Pastor. By Metro: parada "Leganés Central" de la línea 12 "Metrosur"